© 2015 – 2016, Edward Champion. All rights reserved. The first sentence of the piece informs us that Truman was not just a liar but a “feverish” liar; not just an opportunist but a “frenzied” one. Ever since his high voice” “pierced” the “walls” of a “literary elite,” etc. That’s a lot of overwrought journalistic clichés for one sentence. 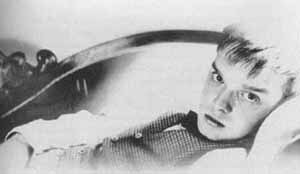 Truman Capote’s voice was outrageous, it’s true. As I kid watching the Tonight Show I thought the little man had to be faking it. I wondered why Johnny Carson was treating such a sissy with respect. Truman was a gossip. Shocking! He himself admitted and insisted upon it. It is an occupational hazard of novelists. They are curious about people — the novelists who manage more than one book, anyway. That he could be an unpleasant (also loving, charming, and loyal) person is well documented. But his unpleasantness might also be guessed, and understood if not pardoned, from the fact that he was an alcoholic and drug addict, one who endured the hell of writer’s block on more than one occasion. Rising above nasty scolds like the author of this article was the least of his challenges. But what is most absurd is the suggestion that In Cold Blood’s enduring popularity is based on no more than our appetite for “gossip.” (That word again!) I am not a fan of In Cold Blood, but it insults its many devoted readers to say that it satisfies only the same appetite as People Magazine. There is no shortage of gossip always and everywhere, so when people read a book from 50 years ago, gossip cannot be all that they are looking for and finding. Thanks for the spirited riposte, Roger. You are certainly right about Capote’s voice and identity being something of a helpful lightning rod for queer identity, and I won’t disagree with you on that point, much less the idea of authors, long before Capote, going out of their way to promote themselves. 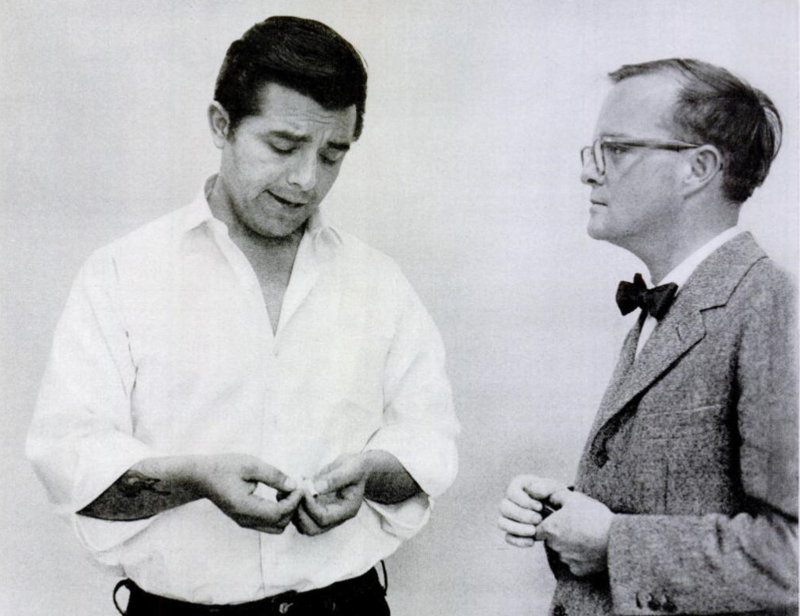 But my essay argues, using highly suspect “evidence” culled from the book and outside sources, that Capote clearly played into the hands of a gossip-loving public and that IN COLD BLOOD is no more a legitimate work of journalism than some hack feverishly transcribing unreliable remarks from local barflies. That his work is still talked about more than fifty years later suggests that Capote believed, to paraphrase the Mencken quote turned cliché, that nobody ever went broke underestimating the taste of the American public. “That his work is still talked about more than fifty years later ” and not only “talked” but read is due to a simple fact that it is good literature. Even for someone like me for whom English is, helas, a second language. than the truth about the final terrifying moments of the murder victims. Is having your throat slit and your family slaughtered a fair trade-off for “good literature” ? Not in my book. Having known most of the folks from Kansas covered in this article, I can tell you that the book is not as far off path as some have tried to paint it. Nye was okay with everything until after the book came out and he hadn’t been seen in it as much of a focal point, as he thought he might be. After he passed, his kids, more-so, his daughter Terri, went on a rampage to try to run down Dewey and Capote as much as she could. Some of the timelines questioned in the actions on the tip from Wells to the follow-up on the info have been reviewed and found that there were no delays in the contact with the Hickock’s in Edgerton, as has been accused. 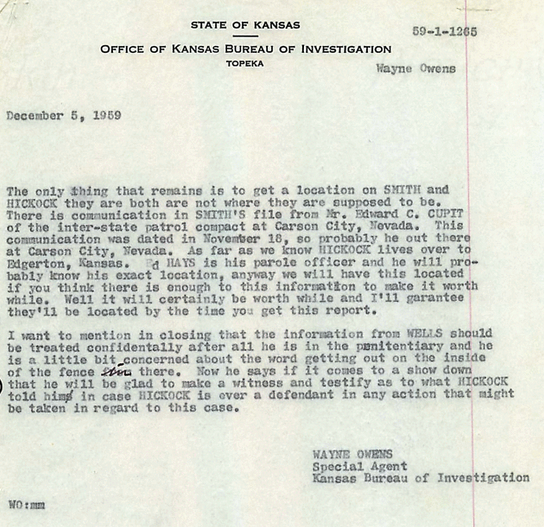 The KBI didn’t put the information of discrepancies as suggested by the byline in the Wall Street Journal piece. It was the Nye children who spoke to the reporters who cast the doubt, erroneously. Maybe their last chance to try to cash in on a side piece to the case and book. She was a librarian. Possibly prepping for a book??? The only blatant error that stick’s out in my mind is Capote’s take on Mrs. Clutter having spells or mental issues. She had an old serious injury that crept up and bothered her at times and she was probably going through menopause. That was the extent of her ailments. She was far more normal and outgoing than what he described her as.